Is the Internet Eroding Europe’s Middle Ground? Within Europe, public debate has become increasingly concerned with issues of identity, belonging and threats associated with ‘out-groups’ (such as immigrants and refugees). These issues are the focus of many insurgent populist parties, which are shaping debates in many countries across Europe. When asked to identify the most important issue facing Europe, survey respondents in 2017 gave the highest rankings to terrorism and immigration – two issues that provoke public debate on the threat of minority ‘out-groups’ to majority ‘in-groups’. Polarisation is reflected in deeper divisions and distrust between opposing groups. There are many indicators of increasing polarisation in European societies (though no agreed measure or major comparative study). The issues around which polarisation is taking place are especially related to national identity, culture and inclusion, between people who espouse cosmopolitan values and people who espouse traditional cultural and nationalist values. 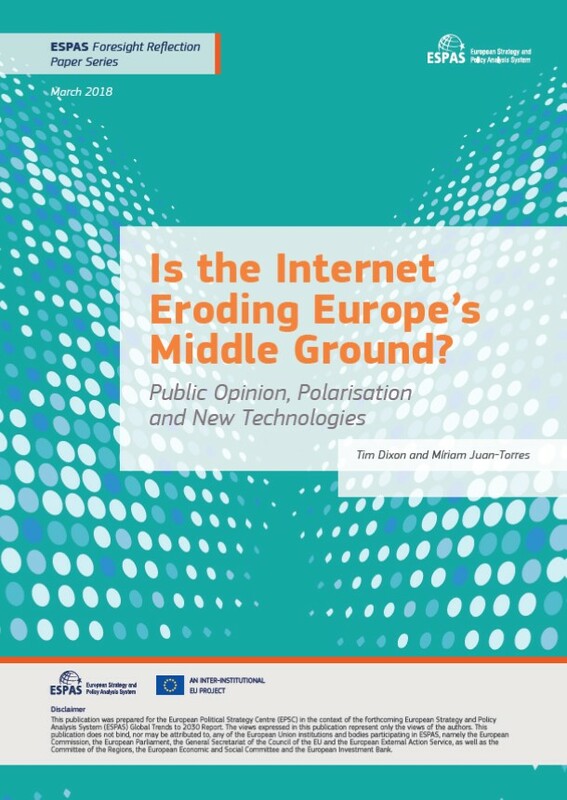 Read more about Is the Internet Eroding Europe’s Middle Ground? The EU faces challenges from the outside and the inside. Most of those are the symptoms of big underlying trends, and handling them needs foresight. The Global Trendometer tries to provide foresight for decision makers in the EU by analysing the changes in these long-term trends. This publication does not offer answers or make recommendations. It presents summarised information derived from a range of carefully selected sources. 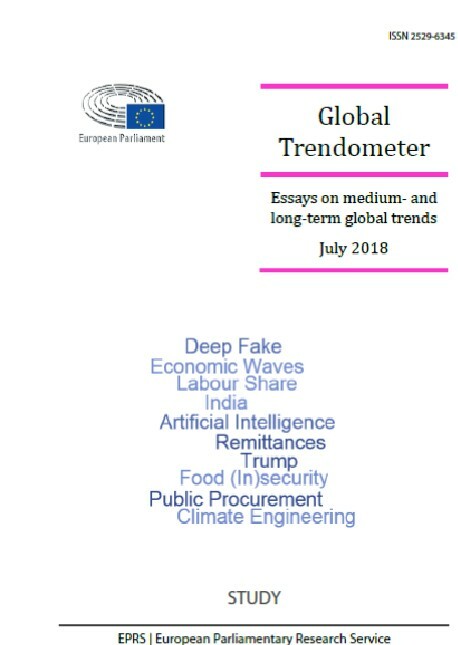 This issue of the Global Trendometer analyses long-term trends on India, the labour-share of income, and democracy and artificial intelligence. It also features two-pagers on geoengineering, remittances, food security in China, economic waves, the US after Trump, public procurement and deep fakes. Rapport du groupe de réflexion au Conseil européen sur l'avenir de l'UE à l'horizon 2030. Ce groupe de réflexion indépendant a été créé par le Conseil européen; présidé par M. González, il a été chargé de déterminer, d'étudier et de proposer des solutions aux défis que l'UE devra relever à l'horizon 2030. Il se compose de 12 membres qui sont d'éminents représentants de leurs domaines d'activité respectifs. L'avis d'experts du monde universitaire et du monde de l'entreprise a également été sollicité. Ce rapport au Conseil européen dresse la liste d'un large éventail de problèmes auxquels l'UE et les États membres sont confrontés, comme la crise économique mondiale et les États venant au secours des banques, le changement climatique et l'approvisionnement énergétique, ainsi que les menaces que font peser le terrorisme et la criminalité organisée. Le groupe de réflexion est convaincu que l'UE peut surmonter ces difficultés, si chacun, hommes et femmes politiques et citoyens, sont décidés à se mobiliser et à agir avec détermination pour donner corps à cet ambitieux projet politique. Par conséquent, il est essentiel que les citoyens soutiennent l'Union et participent à son développement. 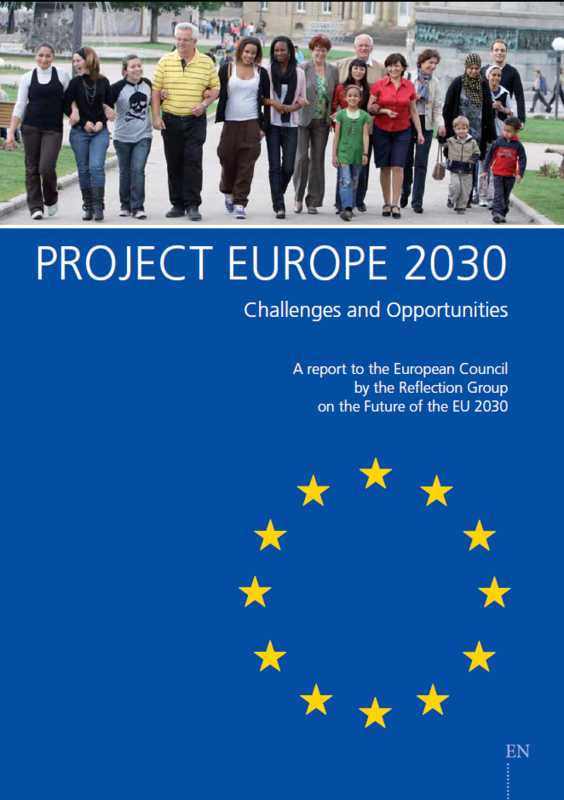 A report to the European Council by the Reflection Group on the Future of the EU 2030. The independent Reflection Group was set up by the European Council under the chair of Mr. González to identify, analyse and propose solutions to the challenges the EU will be facing at the horizon 2030. It is composed of 12 members with outstanding expertise in their field of activity. They have also sought the opinion of experts from the academic and business worlds. This report to the European Council lists a wide range of problems with which the EU and member states are confronted, for instance the global economic crisis and states coming to the rescue of banks, climate change and energy supply as well as the threats of terrorism and organised crime. The Reflection Group is convinced that the EU can overcome the difficulties, if everybody - politicians and citizens - are decided to pull together and act in a decisive manner to develop this ambitious political project. It is therefore essential that citizens back up the Union and participate in its further development. ORBIS is powered by ESPAS, the European Strategy and Policy Analysis System, a unique inter-institutional project aimed at strengthening the EU's efforts in the crucial area of forward planning. ESPAS brings together the European Commission, the European Parliament, the Secretariat General of the Council of the European Union and the European External Action Service to strengthen the Union's collective administrative capacity to identify and analyse the key trends and challenges, and the resulting policy choices, which are likely to confront Europe and the wider world in the decades ahead. Certain Images © shutterstock. For any use or reproduction of photos which are not under European Union copyright, permission must be sought directly from the copyright holder(s). Neither the European Parliament nor any person acting on behalf of the Parliament is responsible for the use which might be made of the information contained in this publication.